The discounted amount is deducted from the par value of the bond to calculate the carrying or book value of the bonds payable. Discount on Bonds Payable is a contra liability account as it subtracts from its Control account, Bonds Payable. Here’s how the bonds payable from above is presented on the balance sheet. We can cut down on the number of calculations to arrive at the total bond interest expense by multiplying the periodic interest payment of $30,000 by 6 payments and adding the total to the discount on bonds payable. 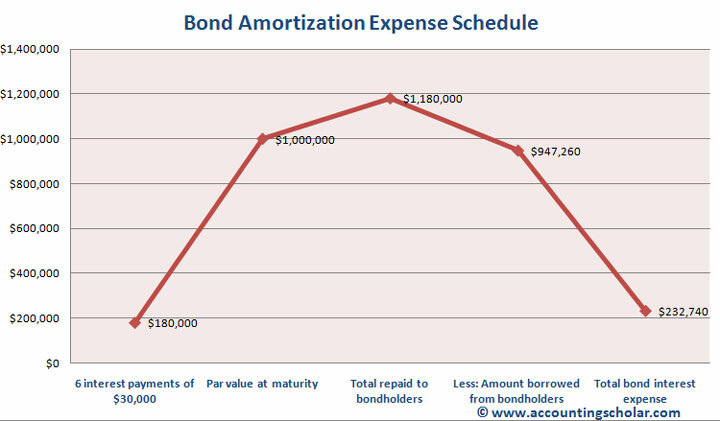 Above is the bond amortization expense schedule graph showing the 6 interest payments of $30,000 each, the par value at maturity, the total amount repaid to bondholders less amount borrowed from them, and the total interest expense in a graphical format.